The first step to making an order might be to read over the questions and answers on our FAQs Page, as many topics are covered there regarding ordering. For our novelty items (including those with personalization) such as Book Safes, iPad Covers, Blank Joke Books, Blank Personalized Journals, Marry Me Books, Guest Books, Create Young Author Bookmaking Kits or other ready made items, please see our Novelty Page. For custom orders, repairs & new bindings you may click on one of the following links to open a .pdf order form to include with your order. The form may be filled out on your computer or just printed & filled in – it can then be sent with your item (for rebinds, repairs or bindings of your already printed items). Otherwise, if you have a file you want printed & bound, you can use the “submit” button on the form (thesis & rebind) which will open an email with the filled out form attached – you then attach your file and send the email. Please allow 4-6 weeks for binding. If needed, one week, 3 day and overnight rush service is available for an additional charge. (Thesis bindings & blank books/journals are completed in one week without additional charge). Please call or email to inquire about the turnaround time you need for your order. We’ll guide you to the right service combining shipping and in house schedules in order to meet your deadline. 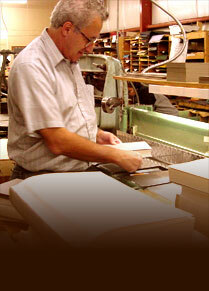 We can bind just one book for you? We do restorations of single books? We can bind blank books for special or even gag gifts?